We are perfume ADDICTS, and that’s putting it lightly. Basically, if we love a scent or even just like it, we’re gonna buy it. Princess Revolution by Vera Wang – Vera Wang can do no wrong when it comes to perfumes. The original Princess perfume was what really started our perfume addiction and it’s still one of top go-to scents. It has notes of black cherry, blood orange, watermelon sorbet, lily of the valley, apple blossom, jasmine, Atlas cedar and amberwood. Doesn’t it just sound incredible?! Cannot wait to buy it. Private Show by Britney Spears – Next month Britney Spears will launch Private Show, the 20th fragrance in her collection. The new fragrance represents an expression of her love for dulce de leche, white flowers and iced coffee. The composition is floral – fruity – gourmand, it opens with sweet and fresh notes of clementine, nectarine and coffee with whipped cream. The heart mixes gourmand notes of dulce de leche with white flowers of orange blossom and jasmine. The warm dry down consists of luminous amber and sensual musk. I’m pretty new to the Britney perfumes, but I’ve fallen hard for them. I love sweet and foody type fragrances and I love that Britney really incorporates these elements into her perfumes. So when I heard about Private Show and the fact that coffee and dulce de leche were notes in it I was like SOLD! Lovely Sheer by Sarah Jessica Parker – As popular as Lovely is, it’s a bit too lavendery and musky for us, so when we heard about Lovely Sheer which is a soft, sheer and gentle follow up to the classic and much loved Lovely, it sounded more like something we’d both wear. It’s described as lavish orange flower blossoms glazed with the citrus splendor of mandarin and bergamot that lead to a glistening heart where fresh gardenia water plays with dazzling pink peppercorn and graceful blonde woods. We’re definitely looking forward to trying this one out. Zoella Sweet Inspirations Body Mist – We’ve never tried any of the Zoella brand products before but we’re most definitely intrigued by this particular scent as it’s inspired by the yummy scent of sweet macarons and macarons are the tastiest things ever in the whole wide world! Lynx Signature Oud Wood & Dark Vanilla Daily Fragrance – We’ve added this one in purely for our other halves, Lynx really know how to drive the ladies wild lol. It has top notes of mandarin, coriander leaves and black pepper. Heart notes of nutmeg and clary sage and base notes of vanilla, tobacco and oud wood patchouli. It’s sounds so fabulous I think we end up wearing it! 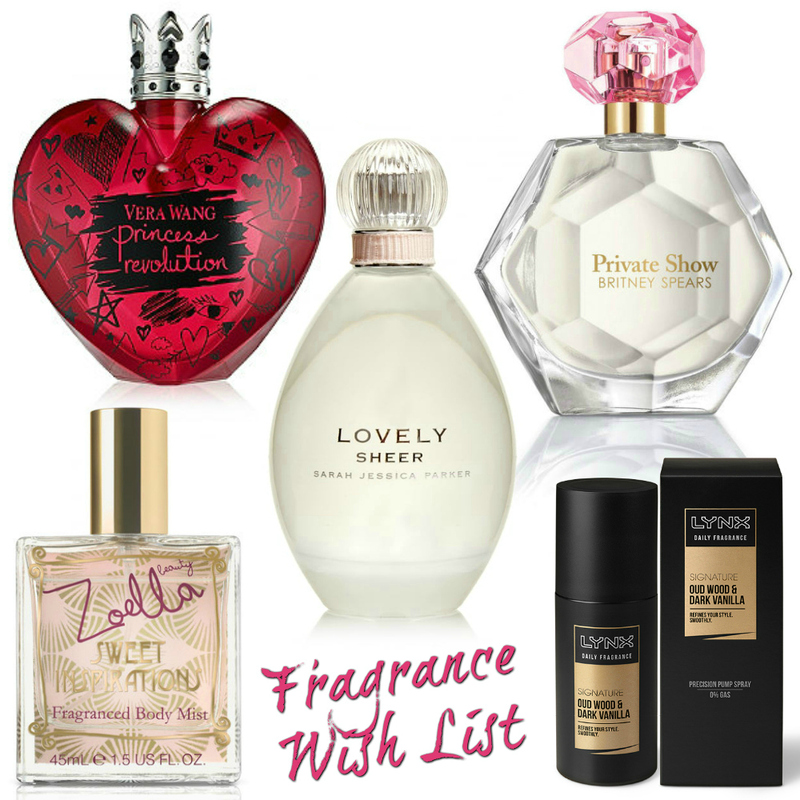 So what perfumes are on your fragrance wish list? Let us know in a comment below.